The ocean in Santa Cruz is part of the Monterey Bay Marine Sanctuary, some of northern California’s most beautiful shoreline. Along West Cliff Drive in Santa Cruz are stunning views of the cliffs and the ocean. 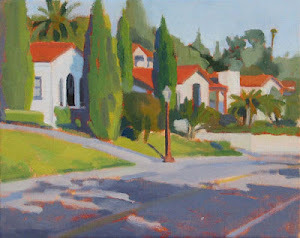 My show is coming to a close on Saturday, Oct 6, stop by the Buenaventura Gallery this week to see the paintings. 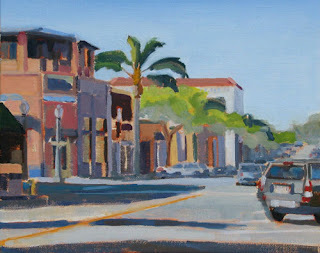 Chris Beirne and I have a reception on Friday night from 5-8, as part of the citywide First Friday art event. This is the last painting I will post from my art exhibit. I picked the location because of the colorful brick building on the corner of Main Street and Chestnut. The building is a cultural landmark with Art Deco influences that has been beautifully restored and is currently a restaurant called Watermark on Main. 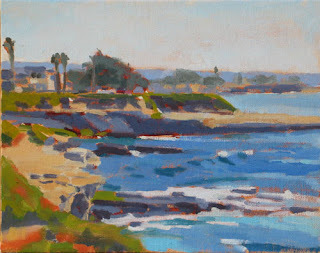 Look for a coastal painting next week!